“We the Indigenous People of Biafra (IPOB) worldwide and the Directorate of State commend our leader and prophet of our time Mazi Nnamdi Kanu for his words of encouragement to Biafrans and the people of Africa at large. The effect of his humble and uplifting words of inspiration is valued and appreciated beyond the borders of Biafraland. Millions of people have been cured from mental slavery through his education and preaching on Radio Biafra. After the arrest of our ordained leader and prophet of our time Mazi Nnamdi Kanu on the 14th of October, 2015, many thought that it was the end of Biafra agitation and IPOB. President Muhammadu Buhari thought he had finally captured and caged the man that has tormented him with so much knowledge and wisdom that has effectively sunk Nigeria to the ground. President Muhamadu Buhari thought Nnamdi Kanu’s voice will never be heard again but his advisers failed to tell him that Nnamdi kanu is not an ordinary man. His vast intellect, knowledge and wisdom alone was so intimidating that Nigeria’s DSS could not understand what was before them or what purpose God intended to use him for in Nigeria. The Nnamdi Kanu in their custody, the one they stubbornly refused to release despite several court judgements, is a Messiah and great liberator. 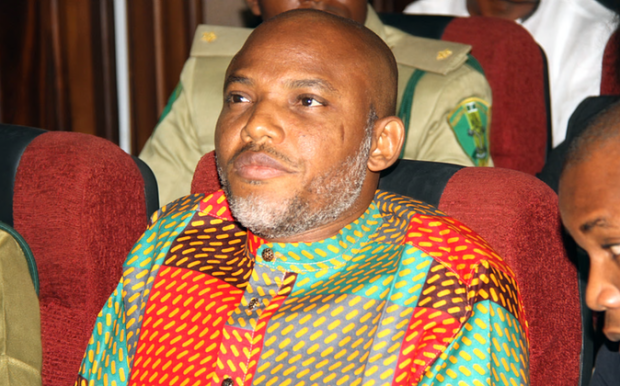 More so, many if not all the predictions made by Mazi Nnamdi Kanu has come to pass and are happening today in Nigeria. There is no other preacher or prophet in Nigeria or wider Africa with the same degree of accuracy of prediction like Mazi Nnamdi Kanu. He was the first to announce to the world via Radio Biafra that Chibok Girls saga was a hoax, he not only said Goodluck Jonathan will lose the elections but he foretold the number of votes he will lose by. He also said that President Obama was out to promote fundamentalist Islam and will replace Jonathan with Buhari. All these are recorded on tape for posterity. Up till today President Muhamadu Buhari, DSS and other security apparatus have not come to realize that something is happening somewhere that is going to sink the contraption called Nigeria into pieces. When the Enugu based Prophet Nwoko announced to the world in late 2015 that “Heaven will Strike if Nnamdi Kanu is not released”, most people thought it was a joke. Prominent politicians with a hand in the persecution of Nnamdi Kanu and IPOB will continue to die until he is released. If they decide not to release him Nigeria will sink beyond recognition. Most people are now coming nearer to the truth and light of God Almighty Chukwu Okike Abiama that Mazi Nnamdi Kanu has been preaching since April 2012. He has said it before now that Nigeria is coming to an end and there is nothing man can do to stop it. If Britain refuses to let Biafra go, Nigeria will be the worst place on earth, worse than Somalia. Even those privileged enough to come close to our leader testify to his words of wisdom and knowledge which has no limit. That is the reason why Nigeria Government is afraid of challenging him to an open debate about his agitation for Biafra. Nevertheless, people are now asking questions about where his wisdom came from or where he acquired this vast knowledge and intelligence. What they don’t realise is that mere mortals do not hear the language of heaven but our leader and prophet of our time hears and understands it. Again, what President Buhari and his DSS never understood or pretending not to understand is that since the arrest and detention of our leader Mazi Nnamdi Kanu, we IPOB have accomplished more in reality for Biafra restoration, compared to when he was free. God does work in mysterious ways indeed. The level of unity and sense of purpose his arrest and detention has engendered in the people of South East, South South and parts of the Middle Belt is unprecedented in the history of post colonial Africa and definitely never witnessed before in Biafraland. We challenge Justice Binta Nyako and the Nigerian Government to prove to the whole world the offence committed by the prophet of God Mazi Nnamdi Kanu and other members of IPOB detained illegally in Nigeria prisons and DSS secret cells across the country. Countless critics, philosophers, scholars, poets, religious leaders, even political elites in Biafraland and indeed Nigeria has been inspired through Mazi Nnamdi Kanu’s wealth of knowledge, intelligence and wisdom. Mazi Nnamdi Kanu is not ordinary and Nigeria is about to find out why he is called “Nwa Chineke” which literally means Child of God. He has become an institution albeit a very humble one, without fear or favour and a deep hatred for injustice and corruption. We IPOB worldwide believe in the impeccable leadership qualities of Mazi Nnamdi Kanu as demonstrated to the world time and time again, that is why we follow to death if need be. The now legendary command and control structure of IPOB has a unique resonance with our leader. At his command we live and die for Biafra to be free.